Found in FNA Volume 9. Treatment on page 8. Mentioned on page 7. Plants suckering, 2–4(–5) m. Leaves: leaflet blades elliptic to widely obovate, 4.5–13 cm, margins serrulate to serrate, apex acuminate, abaxial surfaces ± villous, densely when young, adaxial glabrous or sparsely hairy. Flowers campanulate; sepals pale greenish, greenish pink to pale pink to whitish, 4–7 mm; petals spatulate, 6–8 mm, apex recurved; filaments not or barely exserted, 6–8 mm, equal to or slightly longer than petals, basally villous; pistils villous, styles ± equal to stamens. Capsules obovoid, 3–5 cm. 2n = 72. Ont., Que., Ala., Ark., Conn., Del., D.C., Fla., Ga., Ill., Ind., Iowa, Kans., Ky., La., Md., Mass., Mich., Minn., Miss., Mo., Nebr., N.H., N.J., N.Y., N.C., Ohio, Okla., Pa., S.C., Tenn., Vt., Va., W.Va., Wis.
Leaves of Staphylea trifolia are sometimes 5-foliolate. 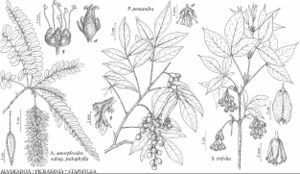 The relationship of Staphylea trifolia with the northern Mexican S. pringlei S. Watson remains to be determined. This page was last edited on 2 January 2019, at 22:38.